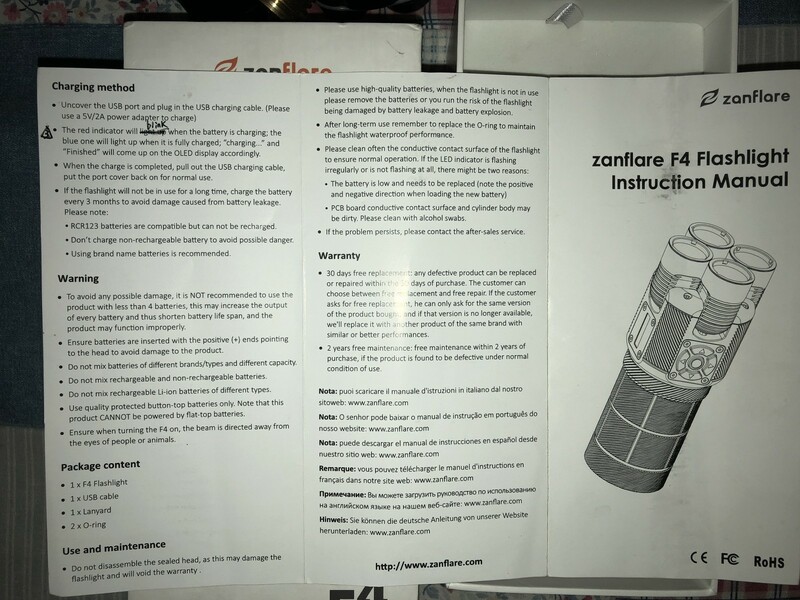 I was asked a while back to do a review on the Zanflare F4 4 headed beasty and I kinda dropped the ball on it. I got a good start measuring output and such and then ran into some issues personally and never got back on it. Sorry about that. So I’m gonna get this started on this with an introduction and will come back and flesh it out as I can. 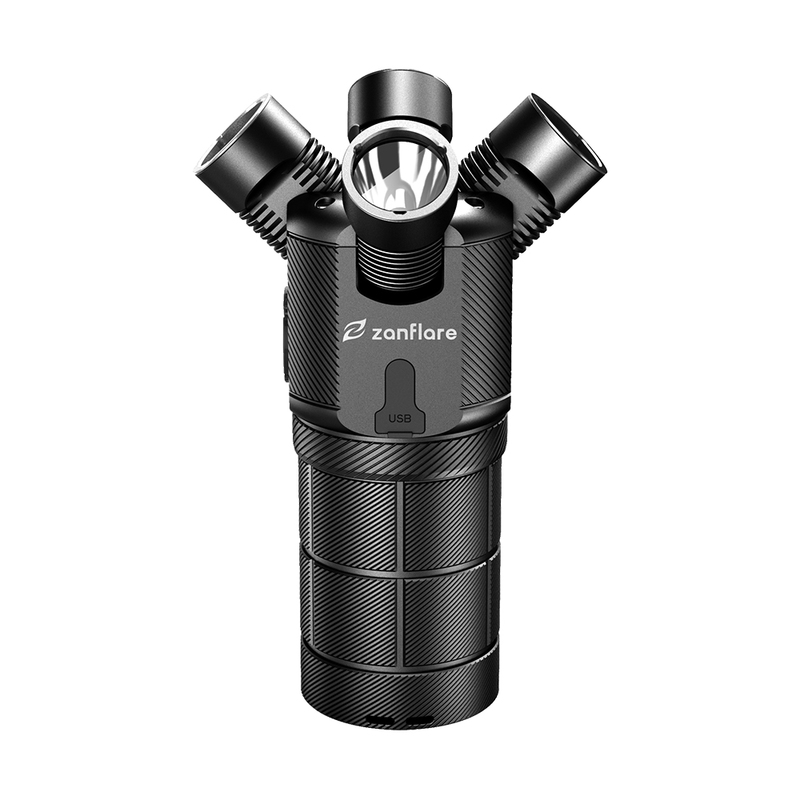 This is a very interesting light from Zanflare, with 4 heads in a similar fashion to the Black Shadow Terminator but each head can rotate down to a 90º angle independtly, and each head can be turned on/off! 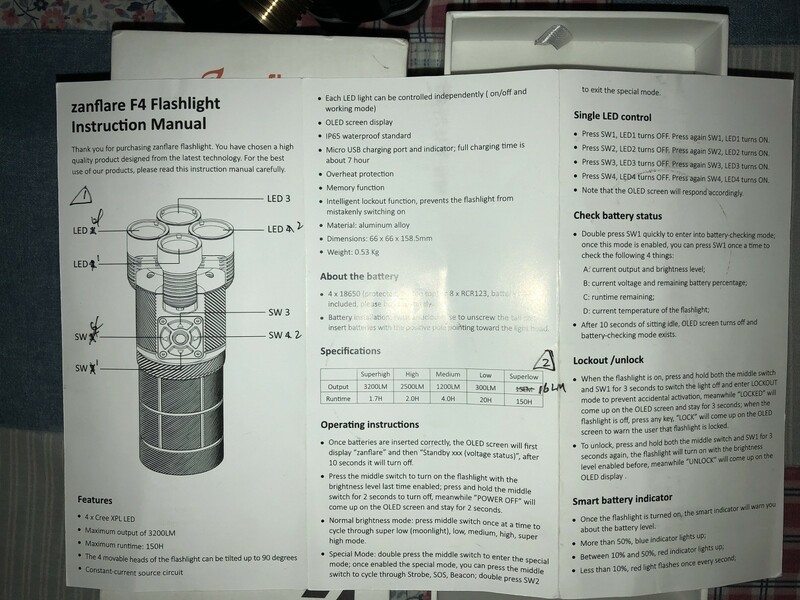 The electronics are elaborate in this light with an Oled window showing which of the LED’s are operational, what level of 5 is being used, how many lumens, how much time is left at that output, the current battery level (4 parallel 18650’s) and even the temperature. Built in charging through a micro USB port as well. I took output readings in all the variations and it is very flexible, I got from 20 lumens to 3560.4 lumens , that’s from one emitter at level one to all 4 at level 5… here’s a quick breakdown of these 20 levels as seen on Sony VTC6 cells…. 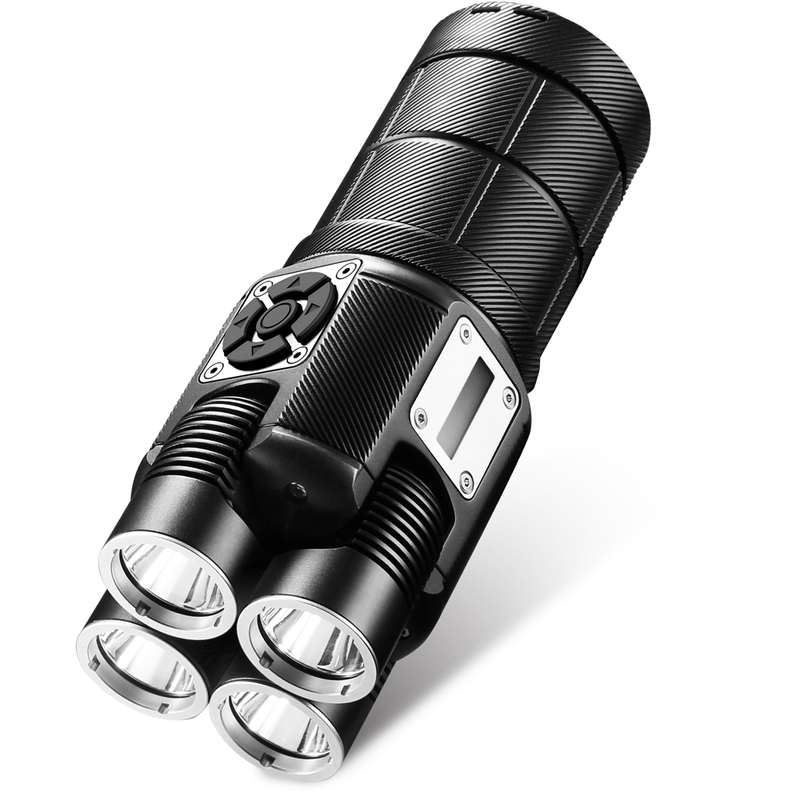 I can see where this might be an excellent light for an outdoorsman, camping or hiking, with the ability to direct light to either side and in front of you while walking while also keeping one head aimed further out for a preview of what’s coming. 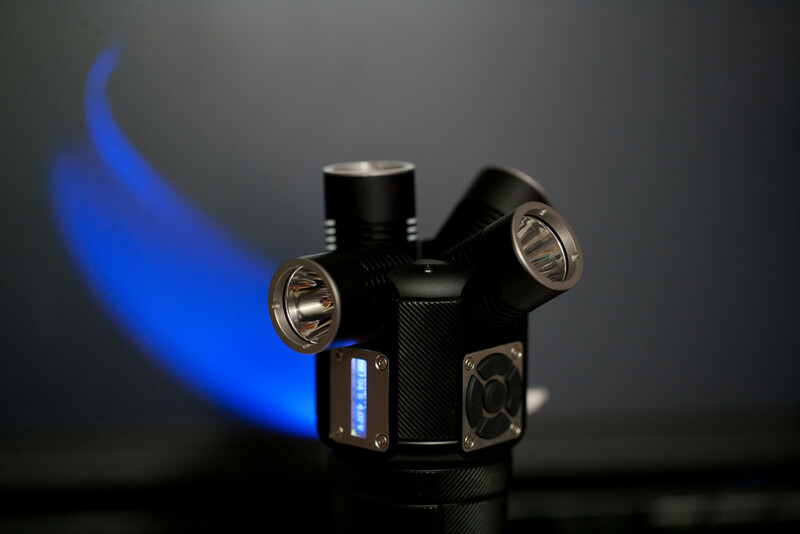 Also in strobe or beacon modes the heads can be flared out to the sides for a 360º coverage to indicate where one is if in trouble. I will get some better pictures and some beam shots as soon as I can, will be back to flesh this out some more… This is a very complex light and I intend to try to represent all it does, please bear with me! 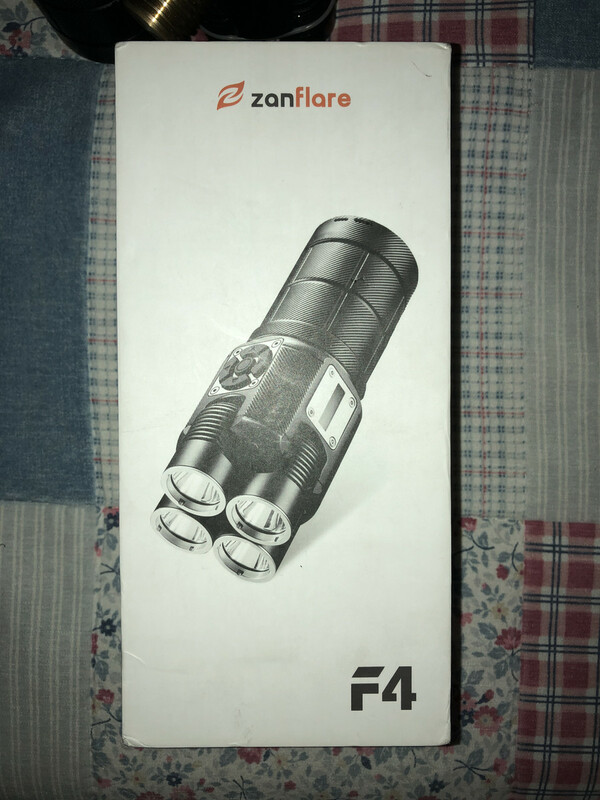 Wanted to say this light uses 4 Cree XP-L HD emitters (domed) that are nearly pure white in tint, I don’t have the specs on what was used in this but the choice was an excellent one. Due to the style of the driver battery contact, button top cells are needed or at the very least solder blobs, this is because of the Q8 style contact board. So, you turn it on with the center button. Each of the 4 arrows controls the on/off selectability of the independent heads. The display shows which of the 4 were turned off (or on) Press the center switch and hold briefly to turn off. Press the center switch AND the lower arrow simultaneously and hold to lock out. Lock out status will display briefly in the window. If you attempt to turn it on when it’s locked out, the display will light and indicate Lockout. 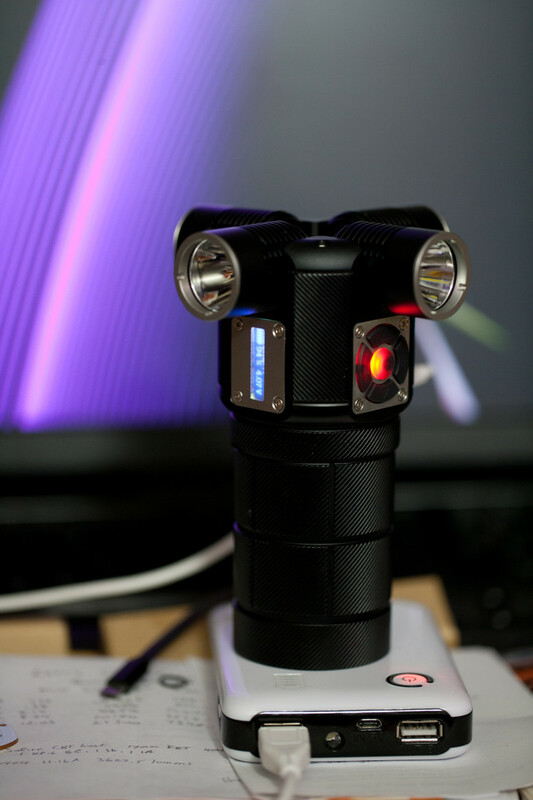 When off, a double click on the center switch enters strobe, a click moves through SOS and beacon modes. The selectability of the heads is active when in the blinky modes so one through four can be selected for brightness levels. It looks like it should have a built-in motor to make the head spin around to truly turn disco mode into DISCO mode! I know, Right? My 10 year old got ahold of it and immediately spread the heads, pointed it down, and brought the “mother ship” in for a landing while slowly rotating it. Had to laugh! Thanks for the rview Dale. How is the power going to each individual head? I’m assuming wires but could be through contact. Can you furnish details on where this light can be found? In fact, it looks very cool from the picture. Brightify to brighten your life! Thanks for the review! I didn’t know it even existed and it’s so awesome! But for me lights of this form need a handle, hoping there is a tripod mount on the other side somewhere to work with a handle mod. There is indeed a tripod mount opposite the switch set. Very refreshing and useful design actually…but where can we find this? Very cool. Did they mention a MSRP? 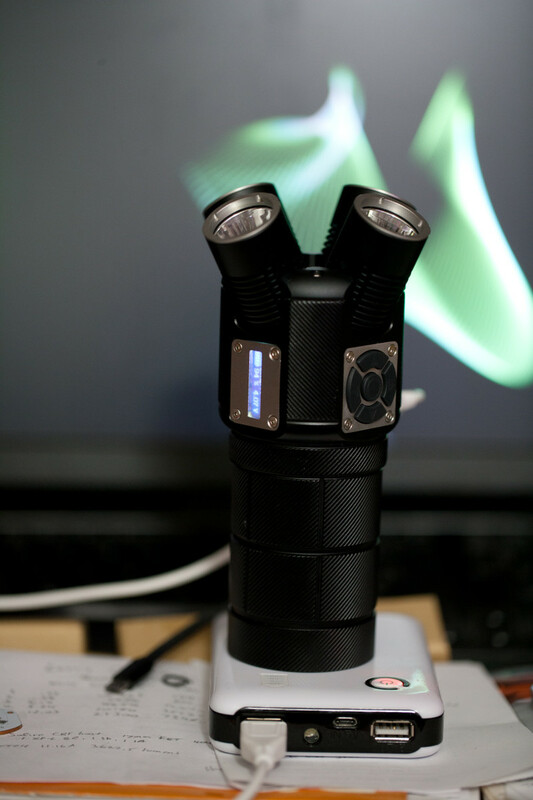 I could find many uses for a light like that at a campsite or working on a piece of equipment in low light. Also, with all 4 heads fired up on level 5. What is the beam like. Is it Q8’ish? todd, the beam is tighter than a Q8, more along the lines of the Terminator as it much resembles that light when all 4 heads are front and center. Design is really out of this world. I found it pretty odd, at first, but I can see after using it a while that it could well have it’s uses and become indispensable. Don’t think there’s anything else like it out there. That is a fun light! They missed an opportunity to make a strobe that circles around the 4 heads. Make it an RGBW light would be fun too. The only thing I can think that would be a useful add on would be a rare earth magnet. To use under the hood of a car, r any other place you might want to hang up a light. Yes I know 3000+ LM is a bit over kill for under the hood, but I am thinking run time would be nice and long at lower levels. Well, it would have to be a very large magnet to hold this thing up. Even a strong Neodymium magnet would need to be fairly large for a tail-cap magnet. Then you’d have the opposite problem – how to get it down. The magnet would be strong enough to give you some real trouble when trying to remove it from any ferrous metal surface. Added a video at the end of post 2 showing the OLED display screen during operation. It’s pretty elaborate what all it shows, fairly cool…. One of the more unique lights of the decade. But unique doesn’t always mean good haha. How much this light cost? So it looks like you can turn on the heads individually which is great, are there different levels for each LED? H-M-L or ramping? Also is there a shortcut to turn on all 4 at once? Or does it start that way? I’m thinking this could be a good candidate for modding to a flood/throw hybird by putting triples or quads (w/floody TIR optics) in two of the heads, and HI’s or dedomed LED’s in the other two. Might be hard to make the spacers though, I wanted to do this on a BST but proper spacers were an issue. 4 triples? Interesting, or two triples and two HI’s…. I wonder if this light would be more useful if each head was mounted on a ball mount so they could all tilt the same direction. That way you could get all the light one target off to the side. Or you could spread the beams slightly for a more area effect. Very interesting light, with lots of potential for light painting art due to the moveable heads. Thanks for the review! Two triples and two HI’s. So we can turn on only the two triples for flood. Or turn on only the two HI’s for throw. Or turn on all 4 heads for max output/flood/throw. I was hoping you like the idea… because I know you can do it. But making proper triple spacers to fit the heads wasn’t lookin good for me. After the past month trying to find a light or driver that worked like this I was kind of shocked when I saw this. How do you scroll through the 5 levels? Taps or long press? Does it scroll through 5 levels and OFF for each switch pad? Also is there a shortcut to all 4 heads ON? Or would you need to circle around and press each button for that? The center pad is on/off, long press for off once on. It also controls blinkies through a double click, single clicks once in the blinkies menu scrolls through the blinkies, double click goes back to normal operation. When on, the 4 arrow buttons turn on/off the 4 heads, the arrow pointing back to you is the top head, the arrow pointing away from you is the bottom head, left and right are left and right. If you’ve turned off any heads and turn the light off, when you turn it back on all 4 heads are back on by default. So you can scroll through 5 modes with only one head, or any combination of the 4 heads, but the menu controls all heads simultaneously in any combination. So you can’t apply a different level to different heads in other words. So click the center switch to turn the light on (if not locked out) It will come on in last mode memory. Scroll to the level desired, select which heads you want working while on. Turn it off in level 3 of 5 with only one head working and when you turn it back on it will be on level 3 of 5 with all 4 working. When they sent me this, I was told it was the only one. More samples were being made for testing, but I haven’t heard what the status is on this. The individual reflectors appear to be approx 21mm in diameter and 21mm deep. The spot provided by these is pretty nice with low spill and no artifacts. There is a SS bezel on top of each glass lens, no AR coatings on the glass, so in theory it would be possible to open each head and gain access to the emitter’s as with the Terminator. I haven’t disassembled anything to date, only put the cells in it. It has built in charging and seems to function well so I’ve used this a couple of times and used an external charger a couple of times. The display window at one point showed 4.15V, each cell was at 4.16V on my MiBoxer C4-12. So the display readout seems pretty accurate.